Industry@Tallinn & Baltic Event announce dates; Storytek_ accelerator opens submissions for second round! Industry@Tallinn & Baltic Event have concluded another successful run, attracting nearly 600 film professionals to Tallinn and seeing the global online media reach double from 2016 results, reaching 70 million in 2017. The two Works In Progress showcases caught more attention than ever before, being attended by numerous high-profile festival programmers and sales companies. Last year also saw the launch of Creative Gate, a new platform launched with the support of Black Nights FF and Industry@Tallinn, aiming to boost regional creative industries and audiovisual talent and reach international markets. CG highlights in 2017 included Screen Stars Tallinn - a young actors' talent showcase that introduced eight up-and-coming actors from the Baltic sea region - entertaining local fashion design showcase Black Nights Catwalk and numerous panels for CG target groups - film music composing, post-production, art production, acting and casting agencies. Launched with the support of Black Nights FF, Storytek_ Accelerator is now accepting applications for its second cohort, inviting creative and media/film-tech entrepreneurs wishing to participate in the 10-week acceleratorprogram starting in March and ending in late May. 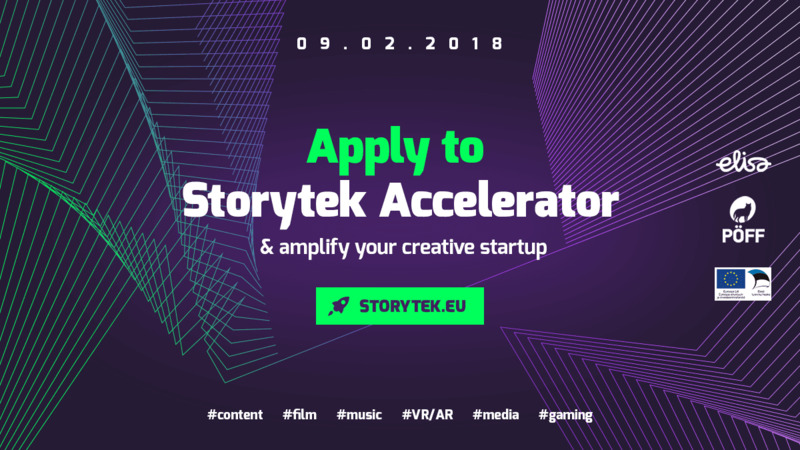 Up to 10 companies will be chosen to attend the program, from there a handful of the best teams will get an opportunity to become a part of the Storytek_ residency program.